Amazon is headed back to the field. Recently, the streaming service announced they’ve ordered a second season of All or Nothing. Amazon has not yet announced a premiere date for season two of All or Nothing. SEATTLE – Mar. 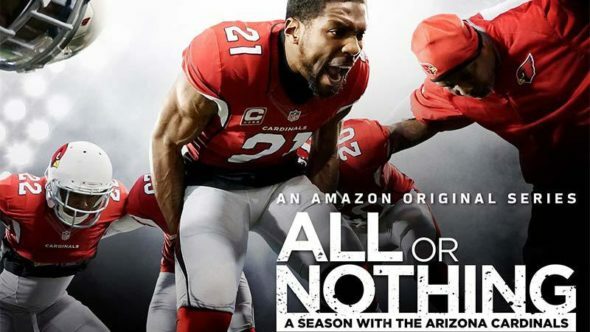 31, 2017 – (NASDAQ: AMZN) – Amazon today announced it has greenlit season two of the Emmy-nominated All or Nothing, an Amazon Original Series produced by NFL Films. This season of All or Nothing will give Amazon Prime members access to an NFL season unlike any that’s been captured on screen. Customers will get to see the Rams’ entire 2016 season, which began with their relocation back to Los Angeles and culminated with the hiring of a new head coach and preparations for the 2017 season. What do you think? Have you seen season one of All or Nothing? Will you watch season two? More about: All or Nothing, All or Nothing: canceled or renewed?, Amazon TV shows: canceled or renewed?